Harmonious Technical is a consulting company which provides a high level of Engineering and Project Management Skills. We provide the highest level of service by only having selected key customers. Power Factor Correction - Audits, Engineering and Supplying solutions. Power Quality - Solving problems related to production loss and equipment failing prematurely. Protection audits - This service provides availability and function testing of protection systems. Power Factor correction can solve an overload on the supply. The UMG 511 power quality analyser is particularly suitable for monitoring power quality according to standards such as the EN 50160. All power quality parameters are collected and analysed e.g. flicker, short term interruptions with fault recorder function, transients, harmonics up to the 63rd and inrush currents etc. Major increases of energy costs make electrical energy a driving force in costing. With the UMG 604, you can make the first step towards better cost efficiency. The precise collection of all energy data and electrical parameters ensures the necessary amount of transparency in your energy supplies. Concepts can be developed on the basis of the data e.g. electricity cost reductions and the introduction of measures. These targeted improvements can also be monitored and recorded with the UMG 604. The UMG 96S is a measurement instrument which is suitable for measuring, recording and monitoring electrical parameters (True-RMS) in low and medium voltage networks. 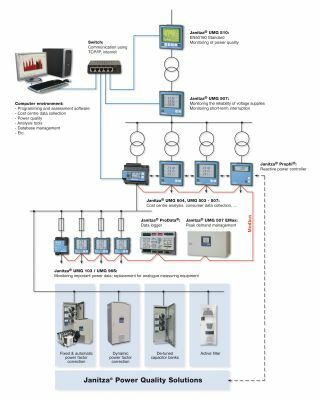 The measurement is suitable for 1 and 3-phase systems with a neutral conductor in low and medium voltage networks.